An art gallery, “d/art” in Taipei now holds a creative special exhibition of Cydesignation. You can see both artworks of published and unpublished by Akihiko Yoshida, Ryosuke Aiba, Sotaro Hori, and me, Hideo Minaba. From 13 to 14, April, they will have live drawings and talk shows (voucher required). Please check the official Twitter account of Cydesignation for details. GRANDBLUE FANTASY FES 2018 will be held on Sat 15 and Sun 16 December. On the same schedule, 15-16 Dec, Cygames Fes 2018 and SHADOWVERSE WORLD GRAND PRIX 2018 will be held. Cygames will dominate Hall 1 to 6 of Makuhari Messe. GRANDBLUE FANTASY FESTA 2017 is going to be held. Minaba will start live painting performance at 12:30 on 22 December. From 11:00 on 23 December, he will also be one of the judges for the cosplayers contest. which was developed by MONOLITH SOFTWARE. Published interview article of CyDesignation with a must-see film of one-hour drawing by Akihiko YOSHIDA. The article ended up as a recruitment advertisement. PlayStation4 App of “FINAL FANTASY XII THE ZODIAC AGE” was released from SQUARE-ENIX. “GRANDBLUE FANTASY the Animation” began broadcasting on April 1st, 2017, though I had noticed that it would begin in January. CyDesignaition performed live painting and lecture at “We are TCA 2015,” the graduation and year-end project exhibition of TCA students, which was held in spite of the possibility of cancellation due to the recent fire at the exhibition site. The details of the animation of GRANDBLUE FANTASY was revealed. GRANDBLUE FANTASY the Animation will begin airing in January, 2017. GRANDBLUE FANTASY PROJECT Re:LINK was announced. The characters in 2D so far will be in high-end 3D. and also that the number of its registered users exceeded 10 million!! I joined a TV program of ASAHI BROADCASTING CORPORATION called GAME KING; it was the special show sneaking into the company of GRANDBLUE for the first time. Host: Akira Kawashima-san (Kirin), Guests: MAPLE CHOGOKIN-san, Miyu Koike-san, Commentators: Famitsu-App Editors, Tarzan Babazono-san. An interview article appeared in the issue of No. 027 of Famitsu-App. NEW!! Website has been redesigned. An interview on COMPTIQ magazine Nov. issue published. I did a live painting at the booth of CYGAME’s GRANDBLUE FANTASY in Tokyo Game Show 2015 as Artist Live. I painted the character that chosen from the public offering (the theme was chosen on the spot) and Seishoju in four hours. That might be seen on Niconico. I contributed an article to Staff Ibunroku, the official website of Genei Ibun Roku ♯FE. http://www.nintendo.co.jp/wiiu/asej/blog/vol006.html And Mr. Yano, the art director for the same category of this article, praised (!?) me. NINTENDO released a Wii U game, GENEI IBUN ROKU ♯FE, in the great collaboration with ATLUS. I’ve joined the product to design Mirages. An official book about graphic archive and resource of GRANDBLUE FANTASY, the fantasy RPG for Android/iPhone, is published from ICHIJINSHA. It has also the section of my interview at the end of the book. The RPG, BRAVELY SECOND for 3DS/ 3DS LL, was released from SQUARE ENIX. I have designed again its background images the same as the previous one. ”Revealing the Secret of LITTLE NOAH Artwork by Akihiko YOSHIDA and Hideo MINABA” was held. I have talked with YOSHIDA-san and OKADA-san from Blaze Games about the newgaming App. Of LITTLE NOAH for iPhone/Android. The scenes from that day. Eventually the GRANBLUE FANTASY registered users exceeded 3 million! It was announced that GRANDBLUE FANTASY would be novelized for the first time! The number of GRANDBLUE FANTASY registered users exceeded 2 million! Downloaded number of TERRA BATTLE already reached 200,000! The new characters MINABA has drawn will be added. TERRA BATTLE/MISTWALKER (Android/iPhone) with monsters of MINABA started to deliver! It is the wholehearted work of Mr. H. SAKAGUCHI. Mr. Akihiko YOSHIDA took office as a director. I've perticipated in ISE JINGU shrine movie project and created the introduction movie including the picture of the first page of current official website of JINGU. GRANBLUE FANTASY has surpassed hundred thousand downloads already! Mobage/Cygames started to destribute GRANBLUE FANTASY that you can play on Android/iPhone platforms. New smart phone game “GRANBLUE FANTASY”, a fantasy RPG distributed by Mobage was announced. I’ve joined as a character designer. Advance registration is now open! It is scheduled for release in this winter. I’ve appeared on Niconico Live program (at nicofarre) showing the conference to announce the game. *It is available to watch for premium members only up to now. In the official website of “Shin Megami TenseiIV” for NINTENDO 3DS by ATLUS, my collaborated illustration is published. I’m deeply impressed that I could draw admiring Megaten illustration and it was placed by the side of gorgeous artists’ works. MINABA Hideo’s interview is included in official website site of “Gyakushu no Fantasica” in Famitsu app. There are old and new illustraters of Gyakushu no Fantasica that 4 million people playing throughout the world. Check out the present of illustration card boards! "Bravely Default", the role playing video game that we have worked on the backgrounds , by SQUARE ENIX for the NINTENDO 3DS, is now on sale. We founded new company "CyDesignation, Inc." with Cygames, Inc., and MINABA Hideo was inaugurated as the president. We will perform design creation and business of video game plan and production as a consolidated subsidiary of Cygames Co., Ltd.
And also we will run Designation, Inc. as the present condition. We kindly ask for your continued cooperation for the both companies. Sakimoto Hitoshi’s music was played by an orchestra with explosive power! “Crimson Shroud” soundtrack is going to be released on June 27, 3045 JPN (tax included). I’ve drawn its jacket! It’s available online, on iTunes, amazonMP3, mora, Listen JAPAN, dwango and so on! The four games of “Guild01”are put into a title. I joined one of the games, “Crimson Shroud”, Matuno Yasumi’s game, and designed characters and backgrounds. Level 5 and followings are released for 3DS, 3980 JPN (tax included). Dungeon PPG “BORDER WALKER”, a fantasy adventure game, from Crunge Products Co., Ltd., is relased online as iPhone and iPod touch application on Apple Store, 900 JPN. Silicon Studio Corporation released application for mobage, “Fantasica”, the game of gathering and organizing cards to attack monsters, basically for free. I have drawn a poster of a rock festival, Fantasy Rock Fes 2012, CLUB CITTA’, Kawasaki, on March 17th and 18th. Their cast is gorgeous as Mr. UEMATSU Nobuo, Ms. TANIYAMA Hiroko, Mr. SAKAMOTO Hideki, Mr. HAMAUZU Masashi, and also Ms. SHIMOTSUKI Haruka as a special guest. I have designed characters, Yeul and Alyssa and the costume of Hope of FINAL FANTASY XIII-2, spin-off from FINAL FANTASY XIII by SQUARE ENIX, INC. I have designed lots of items of LORD OF APOCALYPSE by SQUARE ENIX, INC, such as some stages, Master Guardians, and user interfaces. Right now, I'm joining "Game Circuit Forum" which held in Human Academy all over Japan. Following Sendai and Kobe schools, the next event is to be held in Osaka school, start 1pm on Saturday, 20 August. I will give a lecture with Mr. Ryosuke Aiba who is known as the art director of FF11. If you are interested in it, please join us. I draw [ FF9・Zidane・Kuja] after a long time, and felt weird like I went back to the hometown of my design. New images are added to the Gallery!! The mulch action game,　LORD of ARCANA, which project I have participated in many ways, is now available as a free trial download. If you are a PSP user, please try it! New images are added to the Gallery to show initial visuals from SAKURA NOTE(No release of the overseas version yet.) for Nintendo DS is released by MARVELOUS ENTERTAINMENT Inc.
SAKURA NOTE(No release of the overseas version yet.) for Nintendo DS is released by MARVELOUS ENTERTAINMENT Inc. In Weekly FAMITSU magazine, SAKURA NOTE(No release of the overseas version yet.) took place in the Golden Hall of Fame, following LITTLE KING’S STORY inducted into Platinum Hall of Fame. On 24 July, I’m going to have a lecture at OSAKA COMMUNICATION ARTS, a senmon-gakkou (special school), to show some movies from Marvelous, the Wii game coming on 23 September, and talk about our game developing scene with two special guests. I have worked as a monster designer for the second season of THE TOWER OF DRUAGA, THE SWORD OF URUK, the TV anime. It was my first job to participate in an anime team as a designer. Please click here to see more. New images are added to the Gallery to show initial visuals from MARVELOUS, whose release date TBA, by MARVELOUS ENTERTAINMENT Inc.
Also not yet ready to announce though, now I’m working hard on some titles. I hope I can you about them soon on this website. Stay with us! With my interview pages, SEIBIDO SHUPPAN published“Game Creator ni naritai hito no hon(The book for the people who want to become a game creator)”. As one of young creators, I have talked about my biography in this book; how did I enter this game business, and so on. This year, I’ve got a lecturer position at HAL, an incorporated educational institution and special schools, in Tokyo, Osaka and Nagoya. I’m going to have some lectures. Hard-rock band THE BLACK MAGES, formed by Nobuo UEMATSU and present/ex employees of SQUARE ENIX CO., LTD., let me do illustration of the jacket of their third album, following the previous one. BLUE DRAGON by Microsoft(XBOX360), our company did whose monster design, is now on sale; the core pack bundle version also available. Game development and everything concerning. About business inquiries, new company, CyDESIGNATION managing them. Enter the game industry as a part-timer. Enter SQUARE CO., LTD. (current SQUARE ENIX CO., LTD.). Field graphic designer of FINAL FANTASY V / SQUARE (SN). Graphic director of FINAL FANTASY VI / SQUARE (SN). Graphic coordinator of SUPER MARIO BROTHERS RPG / Nintendo (SN). Artistic supervisor of FINAL FANTASY TACTICS / SQUARE (PS). 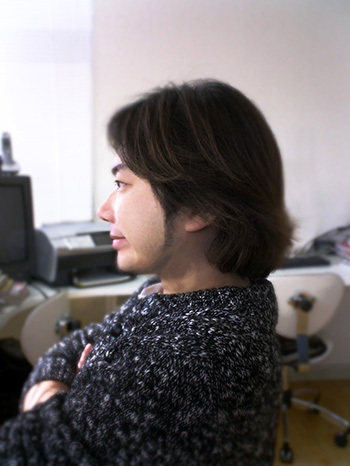 Art director of FINAL FANTASY IX / SQUARE (PS). Design work direction of FINAL FANTASY TACTICS ADVANCE / SQUARE (GBA). Left SQUARE ENIX CO., LTD., founded DESIGNATION.CO.LTD. Art director of FINAL FANTASY XII / SQUARE ENIX (PS2). and A.S.H.-ARCHAIC SEALED HEAT / Nintendo. Costume design of LOST ODYSSEY / Microsoft (XB360). Card Illustration of Lord of Vermillion / SQUARE ENIX (AC). Character design of LITTLE KING’S STORY / MARVELOUS (Wii). Visual design of SAKURA NOTE(No release of the overseas version yet.) / MARVELOUS (NDS). Character design for "Fantasica" by Silicon Studio Corporation for Androind and iPhone. Character design of "BORDER WALKER" by Crunge Products Co., Ltd., for iPhone application, design of characters and backgrounds for "Crimson Shroud / LEVEL5" for 3DS. New company CyDesignation, Inc. is founded. GRANDBLUE FANTASY / Cygames(on Mobage platform) Character design. ISE JINGU official website (introduction movie) Visual art. About business inquiries, new company, CyDESIGNATION managing them. So please contact via. ©DESIGNATION CO.,LTD All rights reserved.